Considered one of the greatest marine disasters in recorded history, the story of RMS Titanic begins in Southampton, England on April 10, 1912, when the vessel left on her maiden voyage. For some of those who lost their lives aboard the ill-fated ship, Halifax, Nova Scotia is where the story ended. On Sunday, April 14 at 11:40 pm, the Titanic struck a giant iceberg and by 2:20 am on April 15, the “unsinkable ship” was gone. The first vessel to arrive at the scene of the disaster was the Cunard Liner RMS Carpathia and she was able to rescue more than 700 survivors. 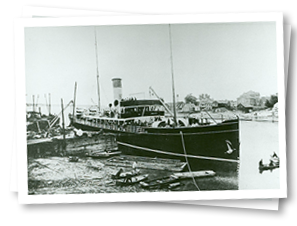 On Wednesday, April 17, the day before the Carpathia arrived in New York, the White Star Line dispatched the first of four Canadian vessels to look for bodies in the area of the sinking. 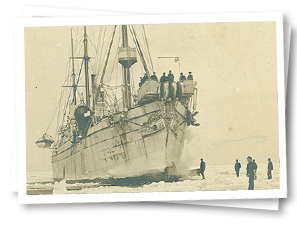 On April 17, the Halifax-based Cable Steamer Mackay-Bennett set sail with a minister, an undertaker and a cargo of ice, coffins and canvas bags. She arrived at the site on April 20 and spent five days carrying out her grim task. Her crew was able to recover 306 bodies, 116 of which had to be buried at sea. On April 26, the Mackay-Bennett left for Halifax with 190 bodies. She was relieved by the Minia, also a Halifax-based cable ship. 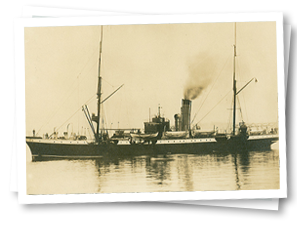 The Minia had been at sea when the Titanic sank, but returned to Halifax in order to collect the necessary supplies before sailing from the Central Wharf on April 22 for the scene of the disaster. After eight days of searching, the Minia was only able to find 17 bodies, two of which were buried at sea. On May 6, the Canadian government vessel CGS Montmagny left Halifax and recovered four bodies, one of which was buried at sea. The remaining three victims were brought from Louisbourg, Nova Scotia to Halifax by rail. The fourth and final ship in the recovery effort was the SS Algerine, which sailed from St. John’s, Newfoundland and Labrador on May 16. The crew of the Algerine found one body, which was shipped to Halifax on the SS Florizel. Only 59 of the bodies placed in the morgue were shipped out by train to their families. The remaining victims of the Titanic were buried in three Halifax cemeteries between May 3 and June 12. Religious services were held at St. Paul's Church and at the Synagogue on Starr Street. Burial services were held at St. Mary’s Cathedral, Brunswick Street Methodist Church, St. George’s Church and All Saint’s Cathedral. Most of the gravestones, erected in the fall of 1912 and paid for by the White Star Line, are plain granite blocks. In some cases, however, families, friends or other groups chose to commission a larger and more elaborate gravestone. All of these more personalized graves, including the striking Celtic cross and the beautiful monument to the “Unknown Child”, are located at Fairview Lawn Cemetery. Photo: Cable Steamer Mackay-Bennett searched and recovered 306 bodies from the loss of the Titanic. Photo: The Cable Ship Minia searched for and recovered bodies from the ill-fated Titanic. Photo: Canadian Government Ship Montmagny which recovered four bodies.